Here we post news about Skipodium management software. Upgrades, tricks, features and case studies for a best use of Skipodium technology. 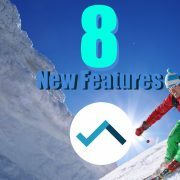 We have just released these 8 features to skipodium.com. Whether you are a snowsports school, a ski resort or an independent instructor, these upgrades can make a difference in your online presence! Register your winter sports business here ! After 2016/17 winter season, we have developed several features to improve Skipodium. Check out these 8 new features.